Bhutan Land Of The Thunder Dragon: Bhutan to Import 200 Truckloads of Chilies! 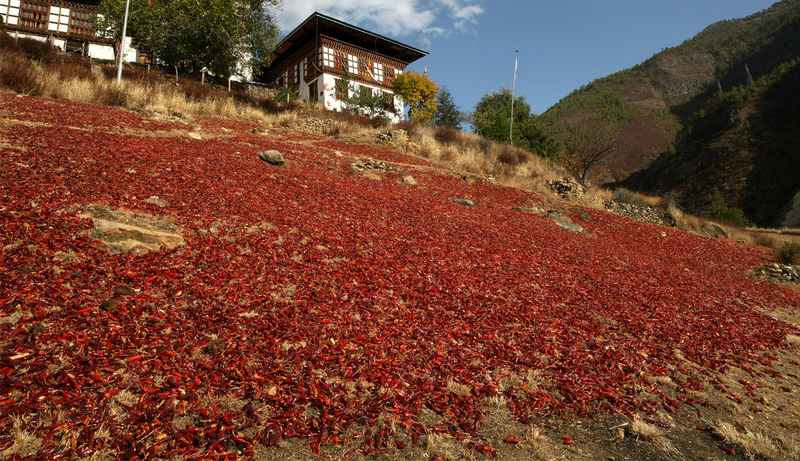 Bhutan to Import 200 Truckloads of Chilies! I was stunned by the BBS announcement yesterday that Bhutan is going to import 200 truckloads of chilies a year, from India. This is a chilling revelation. This means that the land of Ema Datsi has been importing huge amounts of chilies all this while. In other words, the one item of food that most Bhutanese eat every breakfast, lunch and dinner on a daily basis - has no in-country production base, to meet the demand? This truly is pathetic! This revelation is perplexing at all levels. Let us do some mathematics. Two hundred truckloads would be 1,400 Metric Tons of chilies calculated at a truck's carrying capacity of 7MT per truck. 1,400 MT broken down to Kgs. would translate to 1,400,000 Kgs. of the fiery stuff. Now, lets consider that the import of 200 truckloads of chilies from India would constitute 10% of our annual consumption. This would mean that Bhutanese people consume a total of 14,000,000 Kgs. of chilies a year. Let us now make an educated assumption that a total of 40% of the resident Bhutanese population do not eat chilies. That segment would include the population that is still not of age to eat chilies, those that do not eat the stuff on medical grounds, and those group of population that are past the age when they no longer find eating chilies palatable. It would also include those that have been driven to paranoia by Dr. Sonam – about eating chilies. In addition, let us presume that 20% of the Bhutanese population are working outside or are not resident in the country. Add to that 1.46% of the population - under constant labour pain and childbirth, in some maternity wards (based on Bhutan’s 2015 population growth rate). This means that effectively 61.46% of the Bhutanese population DO NOT splurge on the fiery capsaicinoids loaded Capsicum. Based on these assumptions, we get a figure of 305,083 actively chili eating Bhutanese, computed at today’s total Bhutanese population of 791,600. Now divide 14,000,000 Kgs. of chilies by 305,083 chili eating Bhutanese and you get a tidy sum of 45.89 Kgs. of chilies per Bhutanese per year. Break it further down to per Bhutanese per day and you get: 0.13 Kgs. of chilies per Bhutanese per day. This means a Bhutanese consumes a Kg. of chilies every 8 days! The question is: given this humongous captive market, why isn't the Bhutanese people growing more chilies? Why cardamom? Even at Nu.50.00 per Kg., 14,000,000 Kgs. of chilies would translate into Nu.700,000,000.00 per year - SEVEN HUNDRED MILLION Nuggies for a lot of Drups! - while at the same time saving Indian Rs.70,000,000.00 per annum. Just so that we do not have people hunting chillies in our garden ☺ no pun intended la.